The 12" promo for Night Slugs' third official release presents one of the biggest underground tracks of the year - Girl Unit's mighty "IRL". 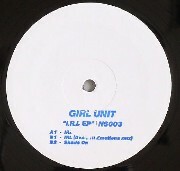 Following years of DJing alongside the Night Slugs camp and recent remixes for Palms Out Sounds and Buraka Som Sistema's Enchufada label, this will be Girl Unit's debut solo release. Already a massive underground anthem in London, "IRL" is being sought after by DJs far and wide. The track's broken 808 drumkit captures the manic energy of Chicago's footwork/Juke movement at a UK-friendly 135bpm, while its monster island horns signal the coming of an ominous beast. "IRL" references both Chicago and London in equal parts, however the arrival of the iconic neon FM synth that permeates the track launches it high into orbit. On the flip, Hyperdub / Rinse FM grime and UK house badman SCRATCHA DVA reinterprets "IRL" with his "Hi Emotions" remix. Piling on the sweltering pressure, DVA picks up particularly on the monstrous vibe of the original. This broken, grimey riddim makes a fitting soundtrack to Godzilla's destruction of some distant tropical island. Finally, Girl Unit picks up where "IRL" left off with the record's second original track, "Shade On". Another synthed-out, juked-out excursion even further into the realms of space, the track's pitched toms are set against arpeggiated harps in a battle of nice vs nasty. Big twelve!